This game was among some odds and ends that I inherited from my grandfather. I'm not sure what game it is, but I find all the markings on the dice really interesting! I like your perspective. We call them 'poker dice' but not sure if that's really what they are called. sally is right. those are poker dice. i don't play poker but the ex had them in ancient times. Great calture of a game I soent far far too ling playing in my mispent youth. A favourite game with my older brother-in-law, I was brought up on it! We called it Max and Jacks. strange how the wallet for them sort of copies the shape of the dice. lovely shapes. Never seen dice like these. They must be part of some cards game. 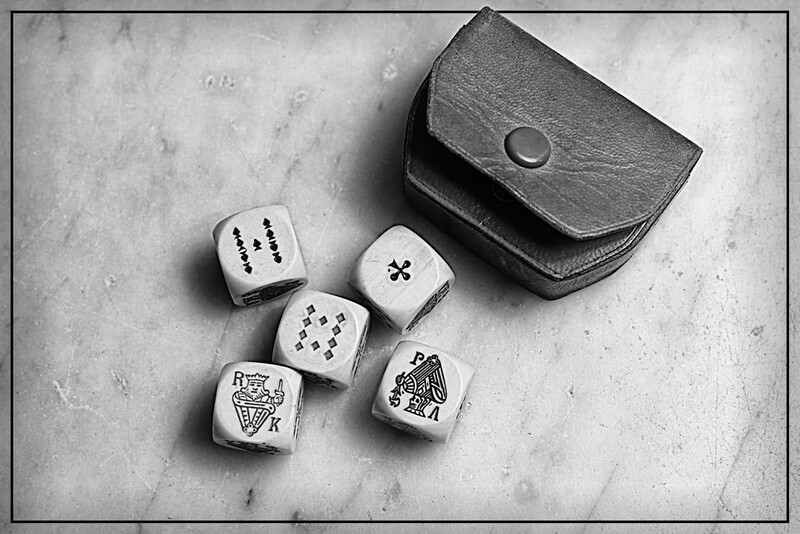 I like the composition in this shot and that wallet to keep the dice in. Oh these look like fun! I love that they are called “poker dice”! Excellent. The die are so interesting looking. Poker dice indeed! Lovely shapes and pattern. Very neat looking dice. I have never seen anything like them before. Thank you so much to one and all! I just love 365- all these years of not knowing what they were and now I have a plethora of information! Mystery solved. Thanks for all the views, comments and favs- much appreciated! It does look like an interesting game. @henrir Thanks Henri! I'm looking forward to reading up on it. Lovely BW shot. Nice composition. My grandparents had a game that I think looked like this one. I did not understand their game either. A lovely keepsake of your Grandfathers and interesting for you to have found out what they are after all this time. A lovely vintage photo of this interesting momento. Lovely family heirloom. Great texture and light. Thank you Sandi, Kerri, Daisy, Katy, Wendy, Kathy and Haskar! @daisymiller check out the links and articles recommended above- maybe your parent's game was a game like this. Interesting, I haven't seen dice like this.